Well, guess what: pretty soon, you’re going to need some new words. Say hello again to The Place, a new-and-improved hangout lair with all the freshly elevated potential you require from a... new-and-improved hangout lair, reopening next Thursday. The first thing you’ll notice about this reimagined Place: it’s sleeker. The new owners have removed the unfinished tiki hut and drape-walled entrance. In their place: red leather booths, a black chandelier, 24 massive LCD flat-screens and a wall covered in skulls and swords (on tear-proof rubber wallpaper, no less). So yeah, if you want, you can meet up with that hush-hush office flame for martinis. 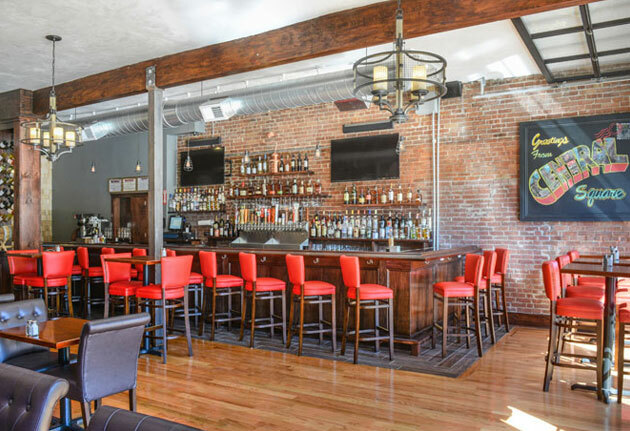 But if you just want to catch the Bruins game with a buddy, you can grab a red-tabled high-top in the bar and focus your eyes on the 60-inch flat-screen. In either case, your overhauled food options include chicken parm sliders, six different burgers (try the 100% grass-fed choice) and Cajun-rubbed chicken tenders. Oh, but they’re still serving pizza until 2am. Some things shouldn’t be messed with.